For various reasons I don't like posting the release announcement and review of a game right next to each other, and what do you know? Some developer usually happens to conveniently release a demo or something right in between posts, so our readers don't get two articles about the same game in a row. 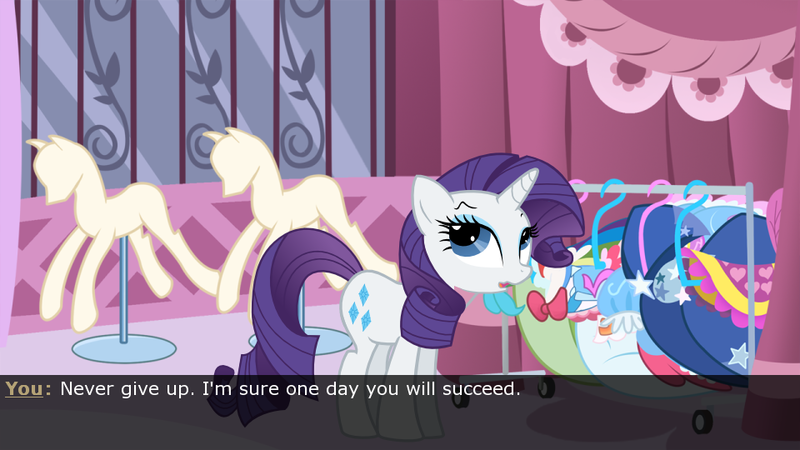 I'm not sure as to why this always happens, but here's a thank-you to Gentlecolt Collaborations for accidentally upholding this odd tradition and treating you all to a brand-new pony visual novel at the same time. Since this is only a demo I'm not going to put a score on the project or anything, but I might as well put some feedback below the break. Fair enough? Initially I had some issues with running Pony Amnesia, as some sort of bizarre audio issue that distorted the music, driving me mad until I finally discovered that running the program through the Ren'Py launcher somehow resolved my problem (which occurred on the 64bit version of Linux Mint 15, if that helps at all). Good thing too, as the project's music is quite pleasing to the ear and definitely not something I would want to play the demo without. The only thing that could make it better would be some atmospheric sounds for the brief portions without music, but it's a bit much to expect that from a fan project. The protagonist (whose name you can choose, if it amuses you to introduce yourself as a certain infamous German chancellor) wakes up alone in the Everfree Forest, with no memories as to who he is or how he got there in a completely original scenario that I've never seen before. Thankfully he is relatively near a road and heads out of the woods into Ponyville; otherwise he'd probably wander around and get eaten by a forest bogeyman or something of that sort, making for a very short and unsatisfactory demo, albeit one that could potentially be rather amusing. 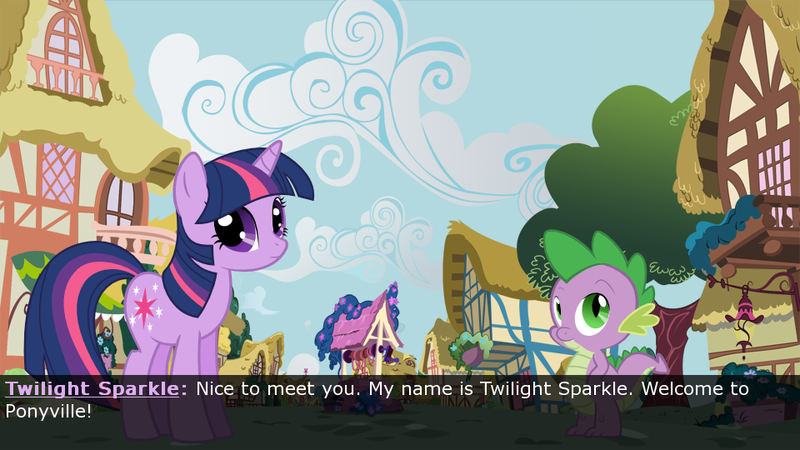 He then bumps into Spike, meets the mane six, and stuff happens. Yeah, thanks for reminding me. The plot may sound fairly generic, and it is, but Gentlecolt Collaborations manages to pull it off fairly well with excellent writing and characterization. Unlike a certain other pony VN to which this will inevitably be compared, Pony Amnesia doesn't make the player feel as if they are being dragged along with no say in the plot, and presents you with plenty of choices. It actually managed to keep my interest for the duration of the demo, and I'm looking forward to any future instalments of the project. As for the art...sometimes the characters look a little off-model, leaning into "unintentionally humorous" territory, but overall it's no big deal, especially with the gorgeous, beautifully-vectored backgrounds that have a distinct lack of those nasty horizontal bars which constantly got in the way of that other visual novel. Still, if I were the character artist I would probably play around a bit more with pony faces to get them looking just right before shipping future releases, because good artwork is fairly important in a visual novel, after all. ...What, you're not satisfied with your plastic surgery? 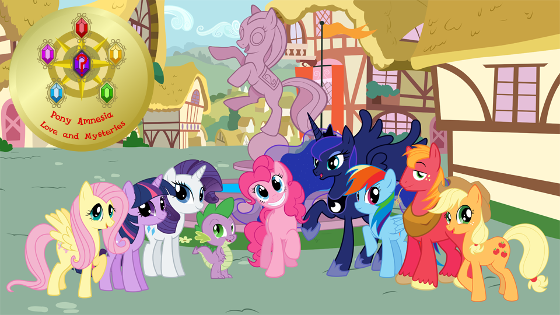 According to the visual novel's website, "The game has a total of four arcs, each downloadable after they have been made, with the player able to choose the gender and name for their pony", and "Each arc lasts a total of seven days, allowing the player to interact with various characters in the game and follow their own independent stories before moving on the main story. Players are encouraged to follow these sub-plots in order to increase their friendship and maybe even establish a romantic relationship further on should players desire one". I'm not all too keen on the romance bits, but despite its clunky name Pony Amnesia: Love and Mysteries should definitely be a project worth following, and I'll be more than happy to review it when the time comes.